Irritable Bowel Syndrome (IBS) is characterized by chronic abdominal pain and altered bowel habits. There may be vomiting, constipation, and/or diarrhea. The pain is sometimes made worse by eating or stress. It is often better after a bowel movement. All diagnostic tests are negative, including blood tests, ultrasound, and endoscopy. In addition, all radiographic studies are negative, including CT scans and x-ray studies such as upper GI series (barium swallow) and lower GI series (in which a barium enema is given). Additional tests may be ordered and these, too, will turn out to have normal results. And, it is important to realize that even though the test results are negative, the pain is still quite real. Hypnosis is a very powerful tool for pain. IBS episodes can be similar to migraine headaches. IBS patients may also experience an aura, similar to patients with migraine headaches. This is a sensation, a warning sign of some sort, that in 10 to 30 minutes, the migraine headache will occur. Often, their pain begins slowly and then escalates. If the pain starts slowly, that can be the equivalent of an aura. Patients who learn self-hypnosis can use the aura or beginning of the episode as a signal to use this technique to prevent it from occurring. Click to learn more about hypnosis for migraine headaches. Medical hypnosis can also help improve a patient’s vomiting, constipation, and/or diarrhea. 1. This is a placebo. A placebo is an inert substance that contains no medication. 2. The placebo effect can be quite strong, like Pavlov’s experiments with the dogs. 3. Although not necessary, a positive attitude can be helpful. 4. You MUST take two pills in the morning and two pills at night. 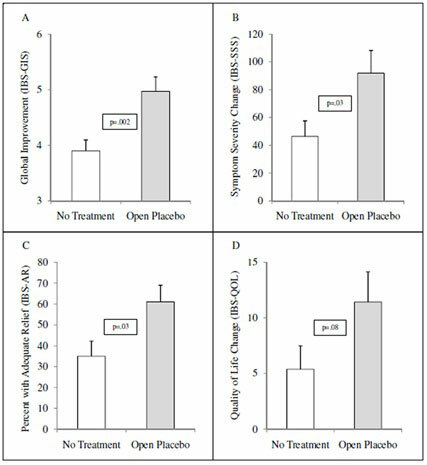 NOTE THAT THE QUALITY OF LIFE IN THE PLACEBO GROUP IMPROVED BY TWICE AS MUCH AS THE STANDARD TREATMENT GROUP! It just goes to show you that the power of the mind is truly amazing! 1. Bahar RJ, Collins BS, Steinmetz B, Ament ME. Double-blind placebo-controlled trial of amitriptyline for the treatment of irritable bowel syndrome in adolescents. J Pediatr. 2008;152(5):685-689. 2. Vlieger AM, Menko-Frankenhuis C, Wolfkamp SC, Tromp E, Benninga MA. Hypnotherapy for children with functional abdominal pain or irritable bowel syndrome: a randomized controlled trial. Gastroenterology. 2007;133(5):1430-1436. 3. Vlieger et al. Long-term follow-up of gut-directed hypnotherapy vs. standard care in children with functional abdominal pain or irritable bowel syndrome. Am J Gastroenterol. 2012 Apr; 107(4):627-31. 4. Keefer, L, presentation at the American Society of Clinical Hypnosis annual scientific meeting, 2013.